Photos/Anthony Victoria: CNN Political Commentator and Correspondent Angela Rye told Cal State San Bernardino students during the Social Justice Summit on February 17 that, “Activism is not optional. Stop asking, start demanding. Don't let anyone in your vicinity with power to oppress." Political Commentator and News Correspondent Angela Rye spoke to Cal State San Bernardino student organizers last Saturday about the importance of “staying conscious” in the midst of political turmoil. Rye, who makes television appearances on CNN, told over a hundred students that attended the Social Justice Summit at the university that they could use the concept of power to do good for their communities. Rye believes current criminal justice and immigration policy is designed to undo the tenets of civil rights in the United States. “They’re trying to undo the second frontier of this civil rights agenda because they think if you take the power, you’re going to use it to oppress them,” Rye said. Rye urged students to turn the concept of power on its head and reclaim it for unity. In addition to Angela Rye’s keynote speech, several workshops were held throughout the day to discuss the importance of lobbying, how to be become an activist, how to become inclusive, and how to maintain a balanced lifestyle. 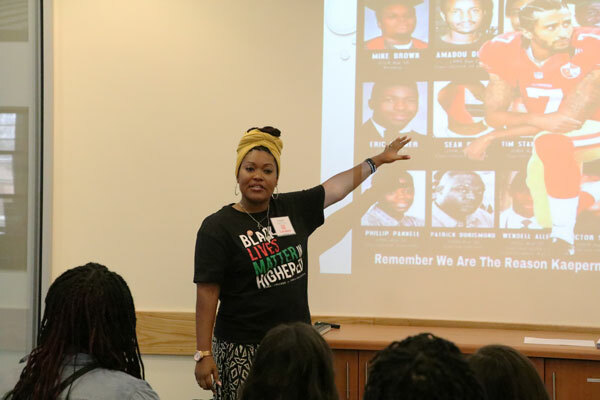 Photos/Anthony Victoria: University of La Verne Education Professor Gyasmine George-Williams speaking to students about student activism and self-care during the Social Justice Summit at Cal State San Bernardino on February 17, 2018. Several student activists also provided testimony about how they have overcome obstacles to empower themselves and others. Cal State San Bernardino Vice President of Student Affairs Dr. Brian Haynes said those issues relating to immigration, criminal justice, and education affect a large number of students on campus. He urges students to speak up about subjects they are passionate about.